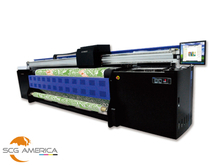 New 3.2m wide-format textile printer delivers superior image quality up to 400dpi and production speed up to 168m²/hr (1808ft²/hr). 27pico-liter drop size allows you to express the detail as you wish. Nozzle recovery function developed by KEUNDO R&D team, automatically finds missing nozzle(s), and quickly recovers them, so stable and consistent printing environment is provided.